Digging for breakfast: It’s a hog thing | Dallas ZooHoo! A few times a month in the Giants of the Savanna habitat, you’ll see our four resident hogs with their bottoms up in the air, tails wagging as they shovel dirt with their tusks and noses. 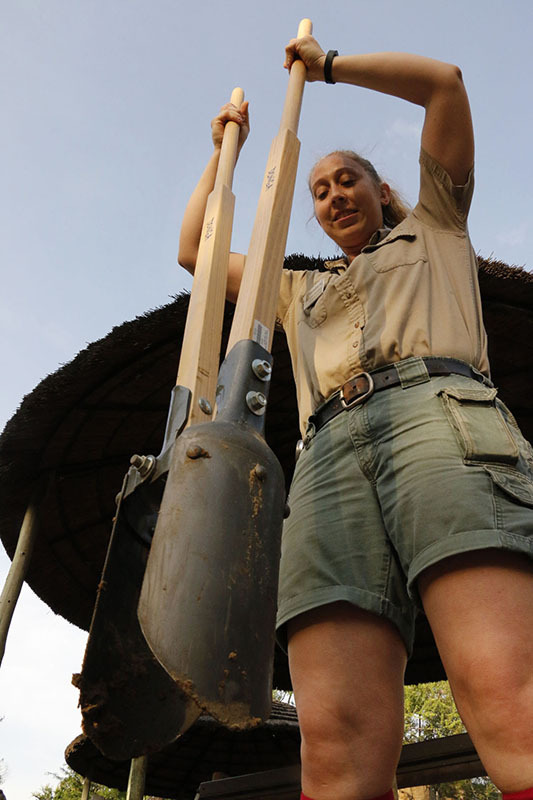 It takes a lot of arm strength and sweat for keeper Christina Eastwood to cut foot-deep holes in the Texas clay for warthogs and red river hogs in their Giants of the Savanna habitats. Hank and Riley, our red river hogs, and Marge and Akoko, our warthogs, dig deep into the ground searching for their breakfast. To keep the hogs enriched, their keepers like to make them work to find their food, just as they would in the wild.A hog’s most natural behavior, when it comes to foraging, is to smell for their food in the ground and dig for it, searching for things like sweet potatoes and tree roots. It’s common for them to dig a few feet down to find their next meal.However, hiding food for some of our animals isn’t as easy as you may think. Armed with a posthole digger, mammal keeper Christina Eastwood gets quite the arm workout plowing through the tough Texas clay. Each time, she creates six holes in the red river hog habitat and another six for the warthogs. The holes are then covered up and the hogs are let in. They usually begin sniffing for their normal scattered food on the ground. When that’s nowhere to be found, Eastwood says they know it’s a “challenging day.” With their incredible sense of smell, the hogs quickly find the holes and begin digging. They kneel down, fold their ankles under, and use their snouts as shovels. Even after they’ve found all the food, they’ll go back to every hole to double-check that nothing was left behind. “Even a week later, Riley will keep checking the holes, thinking maybe food magically appeared or maybe she left one little piece behind,” Eastwood said with a laugh. And as much as we want our hogs to stay enriched and active, we also want our guests to experience one of their natural behaviors. So come early on your next visit to the Zoo and you just may see those bottoms up in the air, digging for breakfast. Check out this video to see how keepers challenge our warthogs and red river hogs to forage for their food.